The Twitch record for most concurrent viewers has been utterly destroyed by a former pro gamer and a dude with the same name as a male duck. Fortnite streamer Tyler "Ninja" Blevins and rapper Drake teamed up in Epic Games's preposterously popular battle royale game overnight and amassed more than 635,000 concurrent viewers at one stage, easily besting previously record holder DrDisrepect's tally of 387,000. For those who don't know, Blevins is a former Halo pro and Luminosity Gaming player whose streaming popularity has exploded this year: he gained 50,000 new subscribers in a 10 day period, and typically gets between 60-90,000 viewers per stream. He was playing on PC, while Drake played on PS4. They won four games together. Pittsburgh Steelers wide receiver JuJu Smith-Schuster and rapper Travis Scott joined the twosome later for some squad action, and apparently old mate Kim Dotcom was on the stream at some point as well. Drake's appearance had players calling for a "Hotline Bling" emote, and over on Reddit, Fortnite community coordinator Chris Attalus replied "feedback noted". 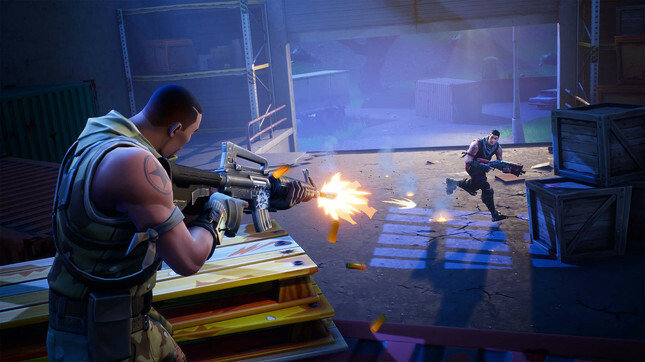 Fortnite is currently the most-viewed game on Twitch and YouTube by a fairly wide margin, and its influence has spread far and wide: earlier this week, several NRL players mimicked the bandage animation from the game after scoring tries, and a number of NBA players are big fans as well. In related news, Epic Games has said that details of the first season of competitive play for Fortnite Battle Royale will be revealed in the next couple of weeks. Last week, Epic Games announced that a full version of Fortnite's battle royale mode is coming to iOS and the Android, and that it will be cross-play compatible with PC, PS4, and XB1.